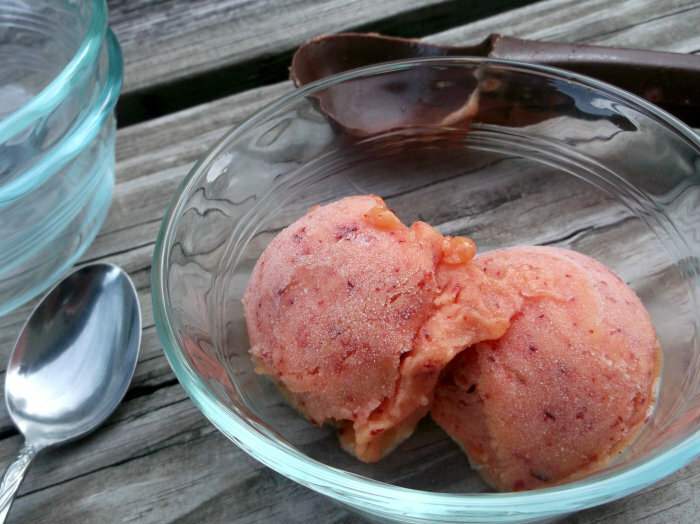 I had found a recipe for peach sorbet that looked delicious. One the best things about it was that you did not have to have an ice cream maker to make it. The more I thought about this recipe the more I knew that I would be making it. If you have ripe peaches in the house I really would encourage to try this recipe. 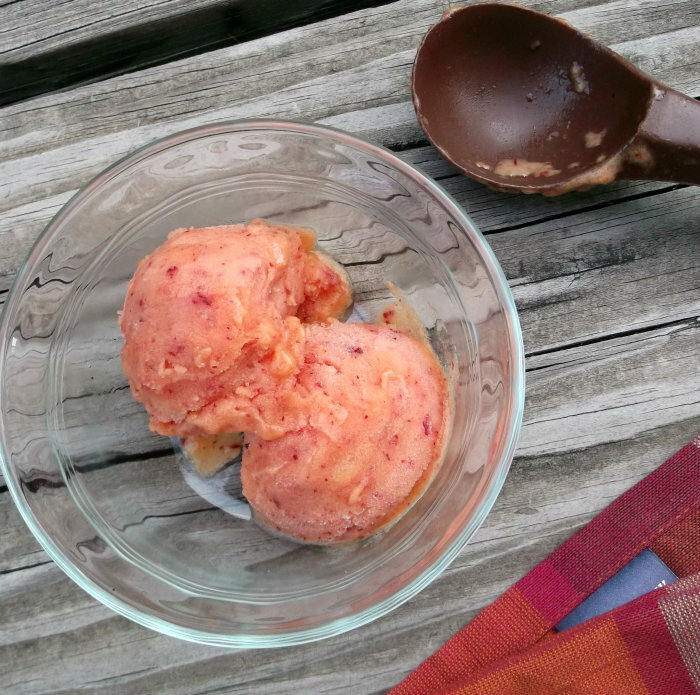 This sorbet turns out so yummy you will think that it was made with an ice cream maker. Another plus it is a treat that you don’t have to feel guilty about and it really is quite healthy for you. 1. Cube your peaches and put them into a Ziploc bag. Place in the freezer for a least 2 hours. If they are completely frozen when you remove them from the freezer let them set for a while so they are not totally frozen. 2. Place the frozen peaches into a blender along with the sugar or honey, lemon juice, and water. Blend until smooth. 3. 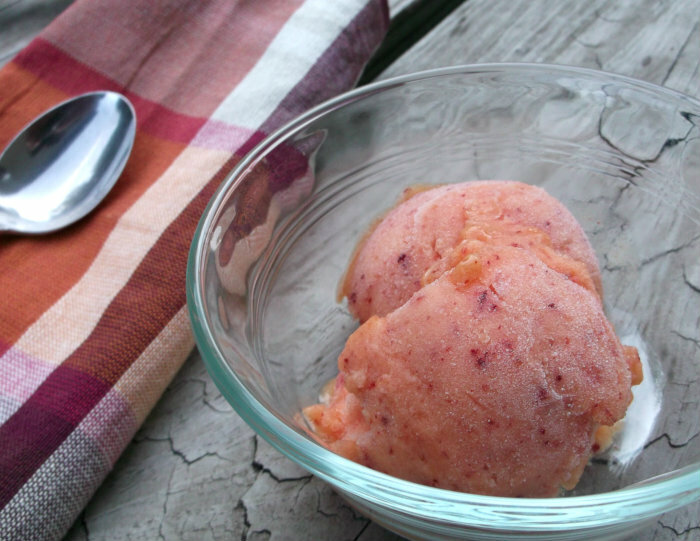 Place the sorbet into an airtight container and place in the freezer until frozen. 4. Freeze for about 3 to 4 hours, if serving the next day take the sorbet out of the freezer 10 to 15 minutes before serving. This really doesn’t require an ice cream maker! WIN. I bet it screams summer. I love sorbet, it’s satisfying but obviously so much lighter than ice cream. I had no idea it was this easy to make. We’re still getting great local peaches, so this dish should definitely be in the cards for us. We’ve done plenty of ice cream this year, but no sorbet. Need to correct that! Thanks. It looks refreshing and so tasty!